Since I had tweeted about the preorder for Clearance's debut full length yesterday, I figured it was about time I reviewed this cassette. I had been holding off on it as I had reviewed the two 7"s that comprise the bulk of it somewhat recently, but there's no time like the present to alert everyone again about this amazing band. Clearance are playing full on 1990's Pavement inspired indie rock. Not only would I have loved this when I was in collage, I love it even more now since it's such a refreshing change of pace from most of the current bands putting out music these days. Maybe I'm somewhat stuck in the past, perhaps I have a misplaced reverence for the 1990's, but as far as music goes, I'm hard pressed to think of a better time to have been buying records. As I mentioned earlier, most of this cassette was previously released as two killer 7"s. Nine of the fourteen songs, if you're keeping track. But the other five songs are also simply outstanding and rebuying a few songs just to get these new ones is completely worth it, even on cassette. I'll go one step further, buying this whole cassette is worth it just for the soon-to-be classic "Carte Blanche." 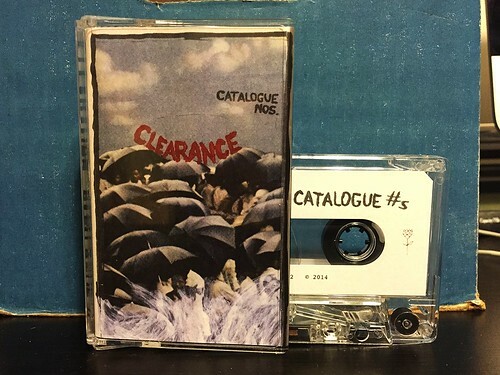 If you like your indie rock to be no frills, straight ahead rock and roll, if you don't need any electronica swirls or other studio tricks gumming up the gears and if you just want to listen to a flat out great band, give this Clearance cassette a whirl. And then after you're blown away, go preorder their full length.